One of the most famous Indian sweet delights/ desserts is the “Halwa”. Be it Aata (wholewheat), Suji (Semolina), Moong daal (Split yellow lentils),gaajar halwa (carrot pudding)…. and many more.. the list goes on.. halwa options in India are innumerable. Every region has its own special halwa, as per its special occasions or maybe no occasion…. just the craving for this sweet delicacy. Halwa is a winter dessert / pudding in Indian homes, as it is considered to keep the body warm and provides energy . 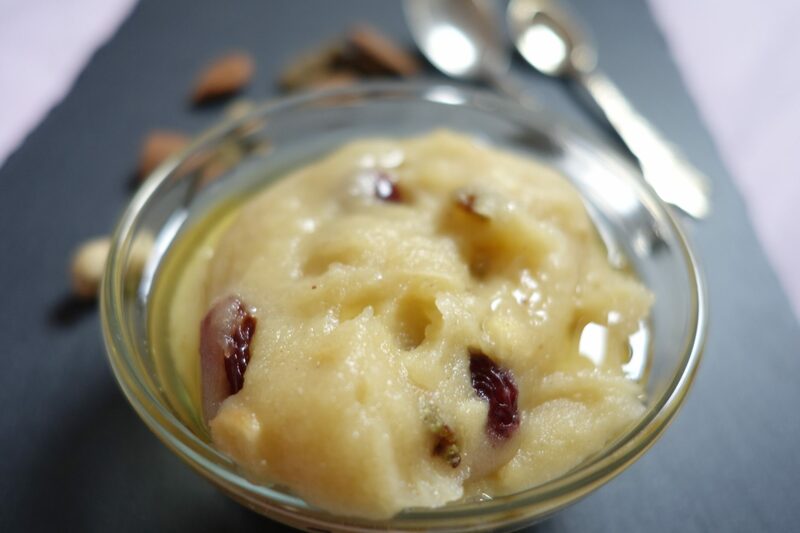 Though for its delicious taste, it is as much a favourite of the families, in summers as well.But yes, every Indian naani or dadi is famous amongst the family ,for her one special variety of halwa, and the kids and the grandkids and the grand dads just love it!! 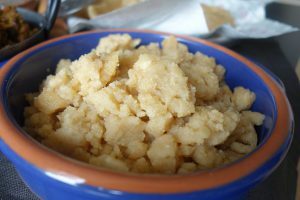 Halwa can be made using a variety of bases- flours/vegetables/ fruits/nuts.The base is thickened and sweetened, purely in ghee, using sugar or Jaggery along with water or milk. It is then garnished using variety of rich ingredients like kesar (Saffron)/rose water/ gold or silver edible leaf (Vark)/ nuts/ resins etc.And if all these things are making you think that this does look like some royal offering , then take note… it can also be cooked ,using just the ghee, flour, sugar and water.. and it still tastes heavenly!!!! It is one delicious sweet alternative, which I never feel guilty to feed my little one.She’s happy that she got something sweet to eat, and I’m happy that she’s relishing something healthy.. (which sadly is not the case very often) . And another good thing is .. My husband loves halwa too.. Though he is not the kinds who has ever ever.. and yes I literally mean EVER asked me to cook him something.. he just eats anything I cook!! Halwa is the only only thing he has ever wanted me to cook for him. Lucky me, Ain’t I ? Because it is a really simple dessert and cooks in no time. Yes, the recipe that I’m sharing is a simple one, but do not underestimate the taste.Cook it, to taste it. I usually do not make the rich versions of halwa all the time, cause my family likes the no fuss plain Suji halwa.Also I make the versions using either sugar, or a mix of jaggery and sugar. The Jaggery version (gud halwa), is another favourite at our home. Amritsar, my hometown is famous for its lovely food, and gud / jaggery halwa is one of the specialities of Amritsar and one of the bests is the gud halwa from kanha sweets . That recipe will be uploaded separately. Today I’m sharing the recipe made using sugar.And yes, it needs to have a good amount of ghee (clarified butter). The ratio that we normally use for making Suji halwa is Suji/semolina, sugar, water,ghee is 1:1:4:1/2. But you will need to alter it depending on the kind of Suji you have. When I first cooked halwa here in UK, using the regular ratio, my halwa turned out to be a little too runny. Then I realised that here we get two varieties of Suji- coarse and very fine. So if you are using the coarse variety, use the above ratio 1 cup Suji/ 1 cup sugar/4 cups water and 1/2 cup ghee. But if you are using the finer variety of Suji, then reduce the water, so the ratio will be 1 cup Suji/ 1 cup sugar/3 cups water and 1/2 cup ghee. Depending on your choice, you can add nuts like soaked, peeled and chopped almonds (or even whole almonds taste good), chopped cashews, and raisins.To make this more rich, you can add chopped pistachios and cardamom powder as well. You can also fry all these nuts separately and garnish the halwa with nuts while serving.I sometimes do not add all the nuts, but just add melon seeds.They really blend in well with the taste of Suji halwa. Some people make the sugar syrup, by boiling the sugar in water, and then adding the sugar syrup in the roasted Suji/ semolina, but I add the hot water before, and add sugar at the last stage. I have tried using both the methods, but have realised, the latter option- adding sugar in the last tastes much yummier than adding sugar syrup. These are just a few things that I have learnt from my experience making this halwa. Hope these help you guys. Take a thick bottomed pan, add ghee and semolina. Stir the mixture till sooji starts turning golden brown .Keep stirring and ensure the sooji doesn't stick to the bottom or else it might start burning. If using nuts, add all the nuts and melon seeds, and stir well. Add water and stir. The mixture will start to thicken. Stir to ensure there are no lumps, and mixture has blended well. Turn off the heat, and add 1 tbsp of ghee and mix. Serve it warm with your evening tea. 1.The ratio that we normally use for making Suji halwa is Suji/semolina, sugar, water,ghee is 1:1:4:1/2. But you will need to alter it depending on the kind of Suji you have. When I first cooked halwa here in UK, using the regular ratio, my halwa turned out to be a little too runny. Then I realised that here we get two varieties of Suji- coarse and very fine. So if you are using the coarse variety, use the above ratio 1 cup Suji/ 1 cup sugar/4 cups water and 1/2 cup ghee. But if you are using the finer variety of Suji, then reduce the water, so the ratio will be 1 cup Suji/ 1 cup sugar/3 cups water and 1/2 cup ghee. 2. For detailed reference 1cup semolina would be app. 200gms , and 1 cup granulated sugar is app. 230gms. Half cup ghee is approximately 100gms of ghee. If you are using a cup to measure, make are you use the same cup to measure all ingredients. 2.Depending on your choice, you can add nuts like soaked, peeled and chopped almonds (or even whole almonds taste good), chopped cashews, and raisins. 3.You can add chopped pistachios and cardamom powder as well. 4.Sometimes i do not add all the nuts, but only add melon seeds.They really blend in well with the taste of Suji halwa, and is a healthy option. 4. 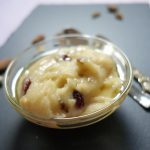 If making this for some special occasion, you can make this more royal by frying all the chopped nuts in a tbsp of ghee separately, and then adding them later at the time of garnishing and serving the halwa. Many thanks for the clarification on the cup measurements! Nothing short of godly…my family loves this, especially our 5yr old boy! I am so glad that you and your family liked my recipe 🙂 Happy to hear that your lil boy loves this too.